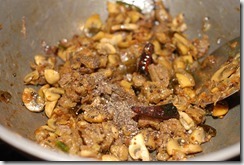 A simple yet delicious nadan style beef and mushroom dish that can be served with rice or chapathis. Hope you’ll enjoy it as much as we did. 1. 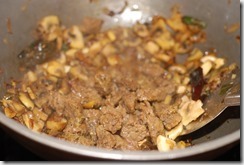 Cook beef with the other ingredients numbered 1 for 3 – 4 whistles until soft. Cut into small pieces. 2. Heat coconut oil in a kadai / pan over medium-high heat. Splutter mustard seeds and fry dried red chilies. 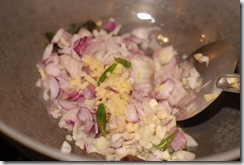 Add shallots, little salt, ginger, garlic, green chilies and curry leaves. Saute until light golden. 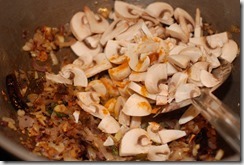 Add mushroom pieces, salt and turmeric powder. 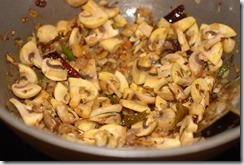 Saute for 4 – 5 minutes. 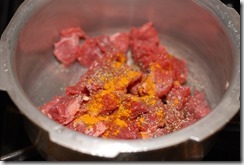 Add cooked beef pieces and fresh ground pepper powder. Mix well. Cover and cook for a few minutes. Switch off. Serve with rice / chapathi.